Between the antenna booster contest and spring cleaning, it's been a busy, busy season at KNOM. In June, we average 20 hours of sunlight a day, and it never gets dark. Since KNOM drops back from 25,000 Watts to 14,000 only at night, summer is the season of our highest power bills, the lion's share of our $36,000 annual electric expense. We're also trying hard to raise funds for a new emergency generator. If you can lend an extra helping hand right now, we sure can use it! Thank you for your continuing support and prayers for our work and the remote families whom we serve. We know that Our Lord will greatly bless you for your generosity. top PALS: Volunteer Vicki Muzik and business manager Florence Busch share a spontaneous hug. 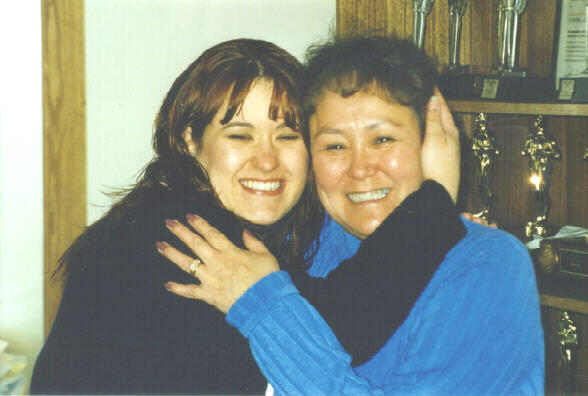 The irrepressible Vicki is currently seeking salaried radio work in Alaska, as her volunteer year ends in mid-June. We'll miss her! INSPIRATIONAL SPOT: When the going is uphill and you feel down--just think of the view from the top. top NEWCOMERS: Over the summer, we'll welcome three new volunteers: Matt Christy from Altoona, Pennsylvania, Michael Nurse, originally from Palo Alto, California, and Victoria Pasquantonio, who hails from Pelham, New York. Please join us in prayer for safe travel for everyone, won't you? SPECIAL PRAYERS ARE NEEDED for long-time KNOM business manager Therese "Tweet" Burik, who left in 1985 to become executive secretary to Bishop Michael Kaniecki, SJ in Fairbanks. She's beloved by two generations of KNOM volunteers. In late April, Tweet fell in her home and suffered a traumatic brain injury. At the end of May, she was improved, but had not fully come out of it, and faced extensive rehabilitation. We've learned that another dear friend, Brother Ray Berube, FIC, is recovering following radiation therapy for prostate cancer. Brother Ray, who now lives in Alfred, Maine, maintained the old, crumbling KNOM buildings from 1979 to 1991. From village to village, the percent of households below the poverty level ranges from 30% to 50%. Unemployment in some villages is 40%, not counting the 60% of adults who have given up looking for work, because there isn’t any. In some villages, fewer than 40% of the homes have telephones. Everyone, however, has a radio, and over 90% of village families (94.8%, when last counted) tune into KNOM every day. They listen for news, for inspiration and companionship. Thank you for making our daily work possible! INSPIRATIONAL SPOT: Remind me, Lord, that charity begins, but does not end, at home. As I am willing to give to those I love, give me a willingness to reach out to those I’d rather avoid. top KEEPING COOL! 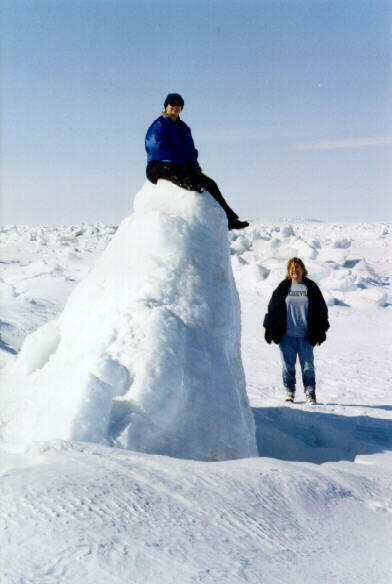 Vicki Muzik perches atop a pressure ridge on the sea ice while fellow volunteer Jodi Engle looks on. The ice is usually gone by now. However, it developed extremely thick and hard this year. The last week of May, one gold miner was still driving a tank-like vehicle on top of it a quarter-mile offshore! As it warms up, old timers predict that the ice may break up around June 15th. 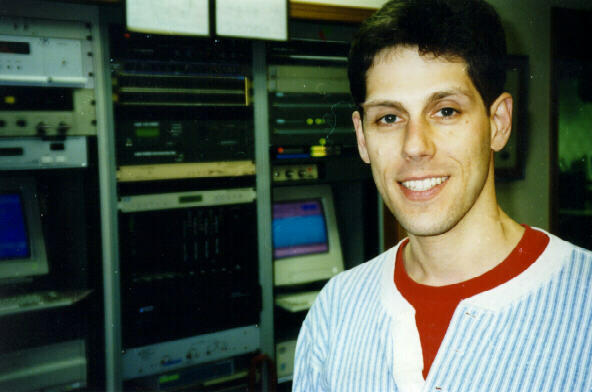 top HEART-WRENCHING: That’s how listeners described an hour-long program produced by KNOM volunteer Michael Warren in May, featuring three young girls who had all given birth at a young age. The girls described the trials of young motherhood and applauded the decision of a friend to remain a virgin. GIVING A BOOST: KNOM volunteer Michael Warren spends most of his time producing interview programs. In May, Michael offered to label and ship all of the antenna boosters which KNOM is sending to villages as part of an immense listener-building contest. By the end of May, we had shipped 312 boosters to 35 distant villages. That’s almost 10% of the households within reach of our signal. The boosters were funded by two large donations, and a host of smaller ones. Purchased wholesale, their cost, including shipping, is $42 each. As you know, most KNOM listeners live over 100 miles from Nome, and these boosters dramatically improve our signal reception. We are giving priority to the most distant points. At a total cost of about 3% of our annual budget, the project is an extremely economical way to increase listenership. The week before Memorial Day, we were receiving 20 to 30 new contest entries every day. The project is more successful than we had dreamed. Your donations have given us the funds to continue the contest, giving away 10 boosters every day, through June 15th. top THE BEST VIEW IN TOWN: Back north for the summer, a robin occupied several mornings in May singing while perched at the very top of the microwave tower at the KNOM studio. 25 YEARS AGO: June 1974, the U.S. Coast Guard cutter “Storis” picked up a party of King Island people, walrus skin boats and all, and transported them to their ancestral homesite of King Island, a rugged and remote rocky point of land some 85 miles northwest of Nome. With them was Fr. Louis L. Renner, SJ, then a University of Alaska professor, writing a book on pioneer Alaska missionary Fr. Bellarmine LaFortune, SJ. Please contact Mr. Hughes with specific instructions that the gift is for the use of Alaska Radio Mission. Mr. Hughes is broker for the Catholic Bishop of Northern Alaska, which owns the KNOM mission. His address is: 215 Cushman Street, Fairbanks, Alaska 99701, phone 907-451-7767, DTC number 733. Thank you! May God bless you for your generosity. MORE POWER TO US: We hope! Thank you to our many friends who have donated to our emergency generator project so far. You have generously given our mission $6,260 toward replacing the generator at our downtown studio. That leaves us with $15,990 still to go. We have far outgrown our little 12 kiloWatt rig, installed in 1993. That’s because we’ve added many computers, which do everything from program the station overnight to automatically control the transmitter. At present, our load is such that we cannot use the generator in automatic mode, and that’s dangerous. We’ve taken very good care of the old unit, and selling it will pay for almost 20% of its much heftier replacement. The new 55 kW generator will ensure that our building’s 17 computers will survive Nome’s inevitable power failures without damage. It also will be large enough for us to add emergency power to the volunteer house, and it will leave us room to grow. INSPIRATIONAL SPOT: Cut up a feather pillow and scatter the feathers in the wind. Now try and collect the feathers. Even though one may be truly sorry for the harm done by gossip, it is just as impossible to repair the damage done by words as it is to recover those feathers. We’d be best off not spreading in the first place. Full size "DOCTOR” KORCHIN REPORTING? Well, not for a year or two, though KNOM news director Paul Korchin has been working on a Ph.D. in pre-Old Testament languages since 1993. These days, most of his spare time are spent working on letters written in cuneiform Canaanite in 1350 B.C. Egypt. The last step of the process, which Paul describes as “intensive,” is the writing of his dissertation. WHEN’S FISHING LEGAL IN MY DISTRICT? For a thousand miles, fishermen tune to KNOM four times every day for fish reports that often last ten minutes, a special public service, thanks to you.